The second USS Cole (DDG-67) is an Arleigh Burke-class Aegis-equipped guided missile destroyer homeported in NS Norfolk, Virginia. The Cole is named in honor of Marine Sergeant Darrell S. Cole, a machine-gunner killed in action on Iwo Jima on 19 February 1945, during World War II. The ship was built by Ingalls Shipbuilding and was delivered to the Navy on 11 March 1996. On 12 October 2000, the Cole was the target of attack carried out by Al-Qaeda in the Yemeni port of Aden; 17 sailors were killed, 39 were injured, and the ship was heavily damaged. On 29 November 2003, Cole deployed for her first overseas deployment after the bombing and subsequently returned to her homeport of Norfolk, Virginia on 27 May 2004 without incident. On 12 November 2009, the Missile Defense Agency announced that the Cole would be upgraded during fiscal year 2013 to RIM-161 Standard Missile 3 (SM-3) capability in order to function as part of the Aegis Ballistic Missile Defense System. 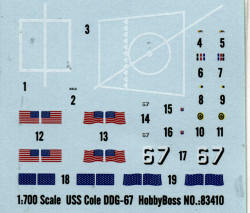 Hobby Boss has added to their 1/700 ship line with this very nicely done kit of the USS Cole. Apparently they have learned that ship builders like to have photo etch railings as this kit is well equipped in that area. This very much helps to offset the cost of the kit as pretty much no aftermarket p.e. will be needed by your standard builder on this one. While on the subject, there is p.e. for the antenna mast, the safety nets around the flight deck, the deck VLS hatches and a number of other smaller bits. All very appropriate for the media. The kit can also be built either as a waterline or as a full hull mode. A display stand is provided should you opt for the full hull option. All of the standard deck fixtures are provided in the kit, which compared to a WWII ship of the same size, would seem to be not many. Modern naval vessels are relatively devoid of deck protuberances. 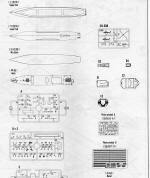 The kit also includes its Mark 45 main gun as well as a pair of Phalanx and other weapons. As with some previous kits, this one has a SeaHawk helo molded in clear plastic that offers the option of folded or extended rotor blades. Instructions are well done and typically offer no in-work painting information. That all must be taken from the large full color exterior painting and markings guide. Markings are provided for just the Cole though I am sure that of one has access to other hull numbers and ship names, other ships of the class could be built. I have darkened the nicely printed decal sheet so you can see the white markings. 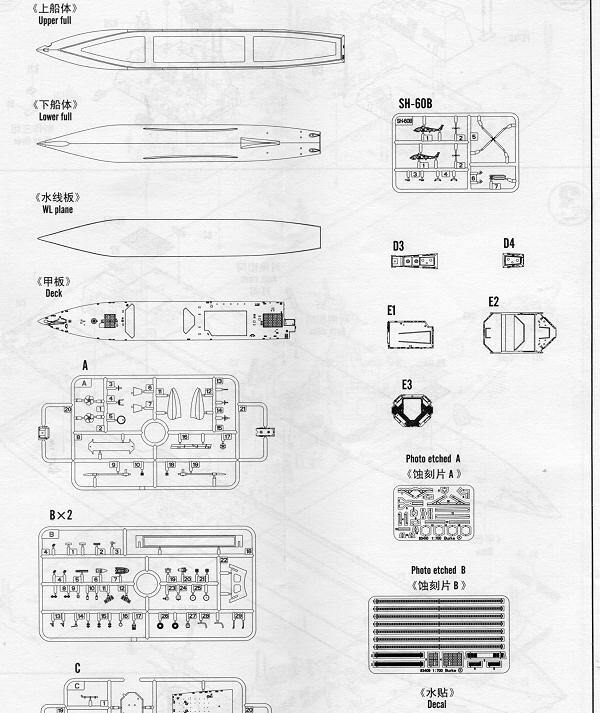 The 1/700 modern ship builder will find this to be a superb kit. It has enough detail to keep most happy and the end result will be a nice model of this somewhat infamous ship.